Welcome to the 510th Metamorphosis Monday! I awoke this morning around 4:00 am. I would say I’m still on Egypt time but I was doing this even when I was in Egypt. I wonder if that’s why I got sick, not getting enough sleep. I don’t know what’s up with my body wanting to wake up so ridiculously early every day, but I wish it would stop. I’m still sick but feeling better each day. Thankfully, the fever is gone, it stopped a couple of days after I started the antibiotic my doctor prescribed on Thursday. I think I was trying to get bronchitis again, but this time I got treatment much faster since I got sick at the end of the trip and not in the middle. I have some interesting “Egypt” posts coming up I think you’ll enjoy, stories about pickpocket attempts, terrifying balloon rides and secret passwords to get you through the front gate of the Cataract Hotel for a tour Agatha Christie’s beautiful suite where she penned much of Death on the Nile. I had hoped to post over the weekend, but I found I couldn’t really gather my thoughts for a post surrounded by two weeks of unopened mail, unpacked suitcases and mounds upon mounds of dirty laundry. I must say, Egypt was very different from any trip I’ve taken. For the first few nights back home, each time I slept I dreamt I was still in Egypt. I would awaken confused as to where I was, not even recognizing my own bedroom for a few seconds after awakening. Maybe that was the 102 fever at work. Thankfully, the weird dreams have stopped and I know where I am these days when I wake up. Apparently, this trip left a big impression! 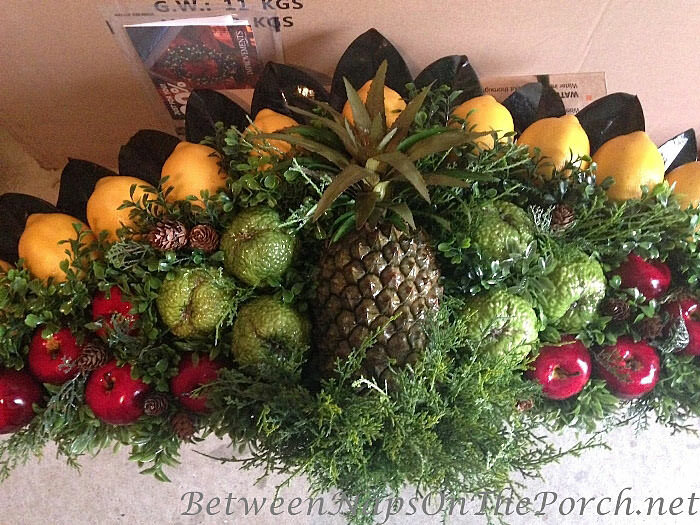 About a week ago I shared this wonderful Colonial Williamsburg style fruit fan Karen made to go over her front door last Christmas. Karen used realistic-looking fruit for her fan so she could use it for many years to come. After that post went up, I received quite a few emails asking if I could find out where Karen purchased the fruit she used since it can be tricky finding good faux fruit that looks like the real thing. In that previous post I shared the link to a form I had found at the Colonial Williamsburg Marketplace online. It turns out, that is the same form Karen used when making her fruit fan. I didn’t realize that when I previously share that link. If you have any trouble finding this form base at the CW Marketplace online, check this previous post where I linked to it: A Colonial Williamsburg Fruit Fan for Your Front Door. Make sure when the project is completed, take the door fan outside and use at least 3 light coats of the spray. Spray from the top side down, the bottom side up – get all the pieces in the nooks and crannies so the rain and snow won’t ruin your work. Spray the back sides of all the magnolia leaves as well. My door fan looks like I just made it, and we had a lot of rain and snow last year. When stapling the leaves to the wood backing, don’t use a heavy duty stapler! It will crack the leaves. Just a regular stapler will work. Also, if the leaves are too large at the bottom to fit in between the nails, just trim them – no one will see the cuts behind all the fruit once you’ve finished. I used an awl to start the holes in the fruit (the lemons were buggers). Then you can push the fruit onto the nails. Line up your fruit as best you can first over where you want to use them. This way, you can make sure the sizes/fit looks good before you start making holes in them. When you get ready to actually put them on, get your hot glue gun ready. You can get all the pieces on, then gently remove them, give them a shot of hot glue in the holes, then slide them back on the nail. Watch your fingers – that hot glue could teach you how to utter an assortment of “words” in different languages!!! lol I know exactly what Karen’s talking about…takes me back to when I made my shell chargers. Hot glue is evil stuff when it comes in contact with skin! Thanks so much to Karen for taking the time to share her resources and all these awesome instructions! Hope this info is helpful to those who emailed asking for more information about how Karen made her wonderful Colonial Williamsburg style fruit fan. 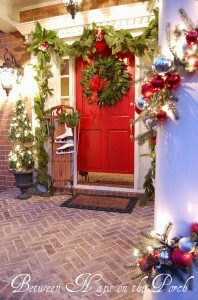 I wish I had space above my front door to use one of these this Christmas, I absolutely love how they look! Looking forward to all the fabulous Before and Afters linked for this week’s Metamorphosis Monday! Tip: If possible, please do not use a Hotmail e-mail address to subscribe. Hotmail’s servers are notorious for filtering out perfectly good emails. Feel free to link up Before and After posts that are home, gardening, decorating, crafting, painting, sewing, cooking, fashion, travel or DIY related. Do not link up to the party if you’re only doing so to promote or sell a product. Thanks to you and Karen for all the tips on the Williamsburg apple fan. I, too, decorate with an apple fan over my front door and use faux apples and magnolia leaves. What I haven’t been able to find is a faux pineapple. 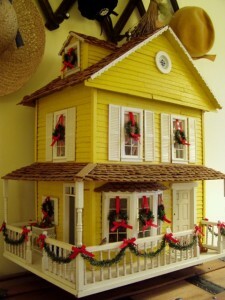 We use a real one and have to replace it several times during the Christmas season. Ugh. 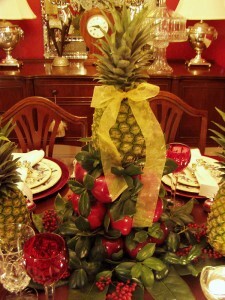 Do you know of a good source for a realistic pineapple that would withstand the elements? Oh, I see that’s not on Karen’s list. I’ll email her and ask where she found her pineapple and will let you know. Thanks, Lisa! Lisa, Karen said she found the pineapple on eBay. I’m so sorry you got sick again. I hope you didn’t miss much of Egypt. Get well soon and take care. Beautiful door header! Thanks for the information. 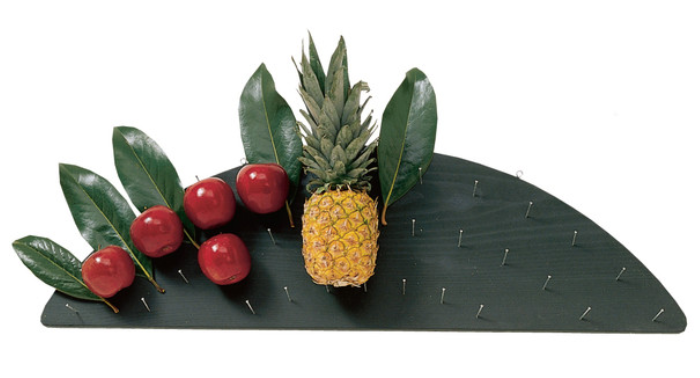 I made them years ago with real fruit and greenery. LOL. Sorry you’re having trouble sleeping. Maybe you need to try Happy coffee and dose. Made a difference in my life. I don’t have trouble falling asleep, I just keep waking up way too early. I think I have too many projects on my mind, posts I want to write, things I want to get done. I wish my brain had an “Off” switch! Does Happy Coffee make you sleep? Thanks, Deborah! I hope you recover quickly and I am glad you are home! Thank you and Karen for providing the sources for the Colonial Williamsburg pineapple fan. I have one and the fruit needs replacing. Such a great idea about spraying the finished piece. Mine hangs over the garage entrance door, since that seems to be the “front” door to my house. Everyone comes through that door! There is no over hang or roof to protect my fan. I will definitely use the spray Karen recommended. I found lemons at Sims Pottery, but you have to have a tax ID. I will check out JoAnn’s for the apples. Hobby Lobby sells a pretty red delicious apple but they were out of stock. I don’t know how they compare to the Apples from JoAnn’s. thank you again for such a great post! Thank you Karen! Wow, Susan, I do hope you’re well on the road to recovery with no relapses. That’s scary stuff, especially when away from home. That’s one area I hope to never become an expert in – death on the nile or any other foreign country! All kidding aside, I bet it feels good to be home. While you were gone, I hit a mega estate sale, got my booths in order at the antique mall, and put the garden to bed! Don’t worry, though, Christmas is still packed away. I’m not that OCD crazy….yet. 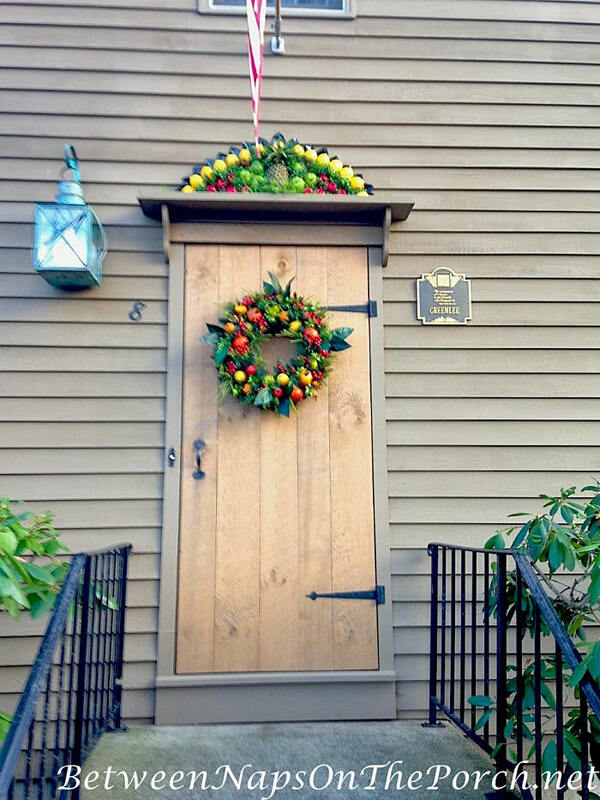 Love the Williamsburg door fan and tutorial. Thanks for sharing, and for hosting. lol You are too funny! Sounds like you’ve had a very productive two weeks! I’m itching to put my wreaths on my front windows but I know the neighbors will think I’m nuts if I do that this early. I’m so excited to hear about Egypt and your adventures..looking forward to all the posts. I’m glad you’re feeling better. Take care. Have you opened a tomb in any of those pyramids? If so, let’s hope you’re not been affected by the pharaoh’s curse! Just kidding, Susan! 🙂 But what’s up with you, getting ill when you travel? You would think you’re used to A/C and such… did you get your flu vaccination this year? You know the more people you come into contact with the higher the risk of catching the flu. I’m just wondering if Teresa also got ill? Susan, your sleep disturbance can be a symptom of jet lag, how many time zones did you change traveling to Egypt? I’m sure you just need a few days to get back to the circadian rhythm your body is used to! Thank you for your concern. Hi – I’m Teresa. I really enjoy Susan’s blog and reader participation. Thankfully, I didn’t get sick and more importantly, the illness didn’t hit Susan until the last night of the trip. We had a 2am return flt out of Cairo, it was exhausting. We parted ways in the CDG airport – she flew to ATL and I flew to IAH. What a trooper – it feels awful to be sick on a vaca. She is so lucky to have this caring virtual community and I’m grateful to be included on a couple of posts. I witnessed first hand how much Susan in turn cares about each and every reader/subscriber. In fact, I didn’t bring my big camera because I knew her pics would be amazing. It’s wonderful to just show my husband her pics from our Egypt trip by sending a link to BNOTP blog page. I log a lot of miles during the year and use various natural remedies like Thyme, a nasal cleanse, wash my hands (a lot), an annual parasite cleanse from Dr. Clark store and drink 2 liters of water/day. Chamomile tea that you suggested is one of my favs, especially during Fall and Winter. I look forward to another sunny adventure! We were adrenaline junkies on that crossing. Glad the fever is gone and you are starting to mend. There was a few days last week, I was waking up at 4:30 also and I think it was too much on my mind as well, girlfriend facing a major surgery, hubby down with a bad cold, fall clean up, etc. Make yourself at least lie in bed to rest and make your lists if you can’t go back to sleep. At least that way your body is still getting some rest before you get up for the day. Push the fluids. Eager to hear the stories and see more pictures. Thankful you are home and will be well for our very fast approaching holidays! Very nice fruit header for over the door. Thanks to both of you. Ah! The waking up at 4 am … daily. When I was, I believe, 56, it started happening to me every morning. It was driving me mad. I spoke to my doctor, in passing, and she said that was a common menopausal symptom. I started hormonal replacement therapy (the natural kind) and, within days, was back to my old self. Four years later, and better educated, I am a strong advocate. Thanks for the info on making the arrangement! And for a great MM! Been thinking of you and almost sent an e-mail to see how you were feeling. Last 2 trips I took to Europe I got sick each time. Began with sore throat and progressed to nasty head colds. Don’t think I had any fever though. Sure makes for a miserable time and flying home sick was terrible! So glad to hear you are on the mend. One thing about the laundry and the stacks of mail, they will be waiting for you when you feel like tackling them. LOL I love the Williamsburg fan!!! Thanks for the update on the Williamsburg fan. If someone can’t afford the back board and use coarse Styrofoam, remember really hot glue will melt it. I grew up near Williamsburg and to visit at Christmas is a real treat. Hate to hear you have been sick. Really shuts down creativity and the will to get all that laundry done. Feel better. Glad you are home safe. Must be all those curses in the pyramid tombs!! 😉 Just kidding! (I see after posting this, others had the same idea!! Hmmm!!) Glad you are getting back to normal!! Williamsburg is so beautiful. Thanks for sharing! Ha! I hope not because we went in quite a few tombs! Glad you are feeling better. Thanks for sharing details on this lovely wreath, and please thank Karen for graciously sharing her resource list and tips. Definitely on my to do list this season! Susan, You mentioned pickpockets in your blog. I just today wondered what precautions you do when you travel. A girlfriend today told me she wears a fanny pack. I did order one for my trip in a few days. What do you do and how do you protect your passport book, cash, etc. I carry my Travelon bag which is a min Fort Knox. I’ll share that story soon and show the bag again. I really do like that bag. Teresa carried her cards/cash in one of the thingies you wear under your clothes around your neck. I tried that once and hated having something hanging on my neck, but it works great for her. Susan, I’m glad your home safely but sorry to hear you got sick. Thanks, Karen, for all the wonderful advice and resource list for creating a door header. When I lived in Williamsburg, I took some courses on Williamsburg decorating and have a book that explains it as well, but you added some helpful info. that it didn’t address. I haven’t done the Williamsburg theme for quite awhile–maybe next year as I’ve another already planned for this one. Hope your health is improving every day. Waking up early every morning is not unusual. Travel to and from overseas will do that. The longer you are in a different time zone the longer it will take to get adjusted to your old sleeping habits. Many people get sick when flying for long hours. So many passengers, carrying all kinds of germs and cramped into a small space, can definitely affect your health. It takes 8 to 10 days (just about the right time it took for you to get sick) for the bug to get you. My husband and I both got sick on our last two trips to Italy. We were lucky both times that it waited until we were home. Can’t wait to hear more about your trip to Egypt. I have fond memories of our trip a few years ago. It is a most fascinating place. I am glad you are back and safe at home, but i am worried about you. You were so sick on your last trip. Was it Germany?, I can’t remember. Make sure you drink enough fluids, esp. tea. and stay away from sugars. I think you should make some ginger tea and honey. You are probably dehydrated from the extreme heat and all the dust in Egypt. You need some homemade chicken soup and lots of oranges too. I like to put some orange in my ginger tea. So, please go to Publix and get a nice organic chicken, onions, celery, and carrots, parsley and make you own soup. Onions are good for your health. Chop up one full onion for your soup. Your sleep patterns will come back once you start feeling better. Too much memories of Egypt and activities awaiting your attention are currently in your head to sleep peacefully yet. Please concentrate on your health right now, the wash and mail can wait. Yup, I caught Influenza A halfway through that trip. I honestly wondered if I was going to die on that boat…terrible experience! This time, it was just a cold that I think, although it was quickly progressing into something else since I began running a pretty high fever. Thankfully it happened the last day or two of the trip. The plane flight was not much fun, though…especially the landing. Thought my eardrums were going to burst. I’m much better now, fever is gone and the congestion is almost all gone. I have been eating a lot of Chicken soup and drinking orange juice. So weird how you crave Chicken soup with a cold! Thanks so much, Patty! Appreciate your kind words and wisdom!